At the High Desert Education Service District, we manage multiple, simultaneous projects. They range from special and early childhood education to technology and building projects. Keeping track of promises, timelines, outcomes, and deliverables is overwhelming. 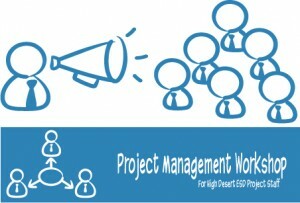 This half-day workshop, scheduled for March 17, provides an introduction to project management, guidelines for each of the stages in a project lifecycle, templates, and resources. Great intro for newbies and refesher course for experienced managers. Project materials available on site.